I have subscribed for the tamil magazine Vikatan.com online. Subscription for one year is $13 and its really worth. I've been subscribing for the past 4 years. I got this recipe from one of their magazine Aval Vikatan. In their last issue, they had recipe for 30 different pulav/biryani. I picked this one yesterday because i was not in a mood to make sambar or rasam or whatever. According to the original recipe, they are asking us to use palak for making this rice, but I used frozen chopped spinach instead. Because i usually buy the frozen box spinach and not the fresh ones. The reason being, i am very lazy....It takes time to wash, chop and then cook. But this one is really easy, just thaw it and cook it in the microwave. Thats what I did yesterday. I am not sure whether the variety of spinach in the box was palak or not. I am not good in differentiating the greens/spinach. When my MIL was here two years back, she told me once that it is palak and the other time she told me that it is sirukeerai. I literally couldn't find the difference between the two. Well.. here goes the recipe. First thaw the spinach(if you are using frozen box), cook it in the microwave for 5 mts. and use the half of the quantity for making this rice. If you are using the fresh palak, then wash it, chop it and cook it for 5 mts. Let it cool. In the mean time, wash the basmati rice and soak it for 10 mts. Drain it after that and keep it aside. Also Grind green chillies, fennel seeds, garlic, cumin seeds, cardamom, bay leaf and cloves into a fine paste. Also add the required amount of spinach to it and grind it nicely. Make sure the spinach is cold before you add it to the mixie. In the mean time, pre heat a pressure pan/cooker with oil, splutter 1/4 tsp of cumin, add cashew and fry it till it becomes golden brown. Now add the Rice to it and saute for a minute. Add the grounded spinach mixture to the ingredients and saute for another 2 mts. Now add required amount of water and salt to it. I added 2 cups of water for 1 1/2 cup of basmati rice. Because, spinach will also release some water. Cover the pressure pan and cook it upto 2 full whistles. Remove it from the stove top. When the pressur is released, garnish it with coriander leaves and serve it hot with onion/cucumber raita. I would like to give 5 stars to this recipe because, my twin girls, who never eat these types of variety rice, ate this rice yesterday, saying "amma this mammam is yummy!" 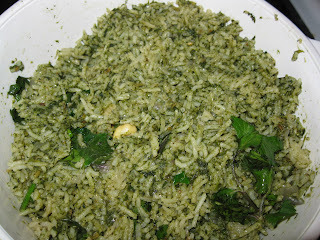 *** - We can also make this rice with fresh palak. Just cut the palak, cook it for 5 mts and then grind it into a fine paste. Looks and sounds yum ! yup I m with you on washing, cleaning keerai. I like the fresh packed spinach in bag - havent come across mud or dirt in it bso far. But, it does have additional non spinach leaves. Thanks to and long live blogs - I come across new recipes every day. I dont know if I like the recipes more or the blog itself. It makes 'what-to-cook-today' decision simpler!